Hibiscus makes a red tea that is naturally high in Vitamin C, antioxidants, and trace minerals. This healthy tea is good for the whole family, and a boon to dieters as well. It may even help lower your blood pressure. 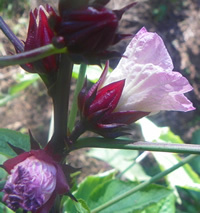 Hibiscus and adds a tart red note to many herbal tea blends. Recipe Instructions: Herbal Tea : Use 1 teaspoon of dried herbs to each cup of hot water. Infuse in a covered container for 10 minutes. Delicious hot or cold.